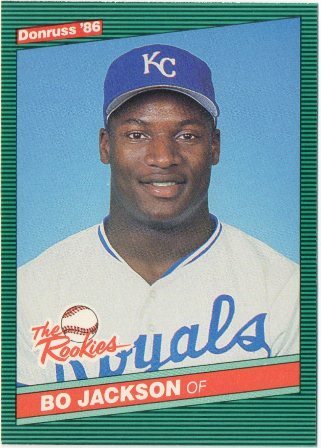 The Man likes Ryan Braun, as do I, but for guys who find themselves in the news in dubious ways - I can't think of two other athletes in Major League Baseball who have been handled with such kid gloves like Braun and the one-time crackhead in Texas who had some sort of alcohol relapse Josh Hamilton. What I really want to say is it pisses me off the media and fans are so fickle - they build up a Braun and a Hamilton, so even when they mess up, fans aren't as eager to turn on them, like they do with certain types of professional athletes. Along the lines of how I see things, this author at this Texas Rangers SB Nation fan Web site talks about how Braun's case played out in the court of public opinion - the perception totally would be different if it was one of the 'black eyes' in the sport having successfully appealed his failed PED test on the grounds the sample wasn't handled correctly after it was secured. Actually, that's not quite true. 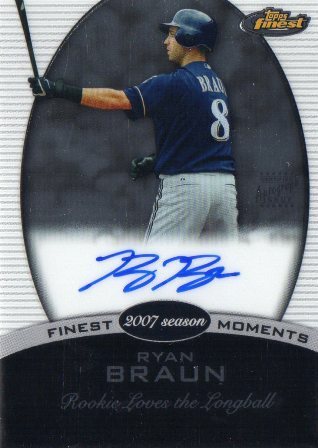 Braun is someone who is well-liked and well-regarded around the game, someone the mainstream media seemed more than willing to believe when he professed his innocence. 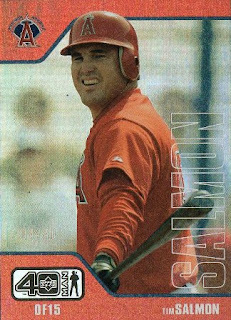 Could you imagine how different the reaction would be if this were, say, Manny Ramirez, who had gotten out of a suspension by challenging the test on chain-of-custody grounds? Or Alex Rodriguez? 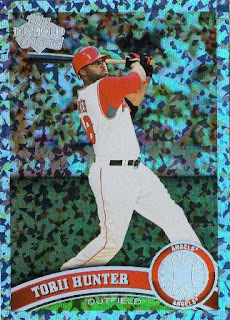 Or Hanley Ramirez? 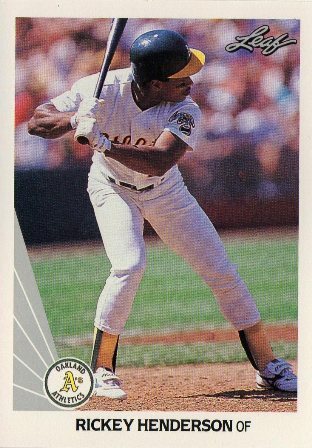 Or (when he was playing) Barry Bonds? Or some other player who is seen as a phony, or doesn't treat the press right, or is a jerk in the clubhouse, or doesn't play the right way, or otherwise doesn't fit the mold of what the mainstream baseball media believes a good and proper baseball player should be? For better or for worse, Braun will probably get a standing ovation in his first at-bat in Miller Park this season - I guess I can't really hold anything against him except I think he did cheat, he was caught, got off on a technicality and now doesn't have to explain anything to anybody. 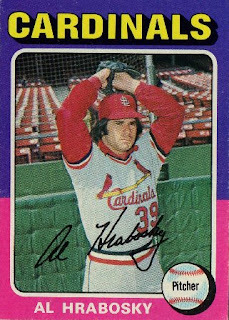 I don't know if I'd set out to go out to look for something specific in mind when I finally got a chance to go to a card show where they sometimes still sell cards - this one vintage dealer with a booth uncharacteristically has some assorted nickel and dime junk to rummage through, so I dug out the following cards from the quarter box. 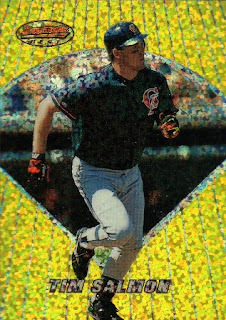 1994 Bowman's Best Tony Clark #62 - it's probably how the technology in making these cards have aged, but there seems to be some discoloring issues with the foil / refractor surfaces. 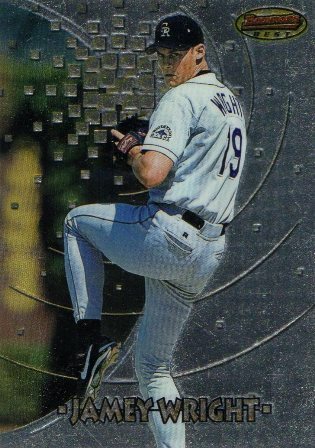 1997 Bowman's Best Jamey Wright #181 - as a baseball fan, I find it kind of fascinating how journeymen [85-121, 4.93 ERA] like Wright latch onto MLB jobs towards their mid 30's and possibly through their early 40s. 2000 Topps Traded Chrome Brian Sanches #T64 - he was signed this past offseason to see if he can make the Philadelphia Phillies Opening Day roster. 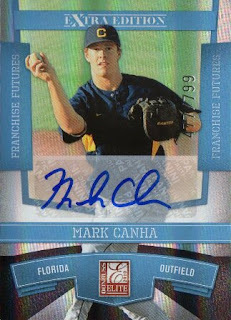 2010 Donruss Elite Extra Edition Mark Canha certified auto [$2] - this random pick up quietly finishes off the first group of cards I've purchased and shipped from Check Out My Cards. 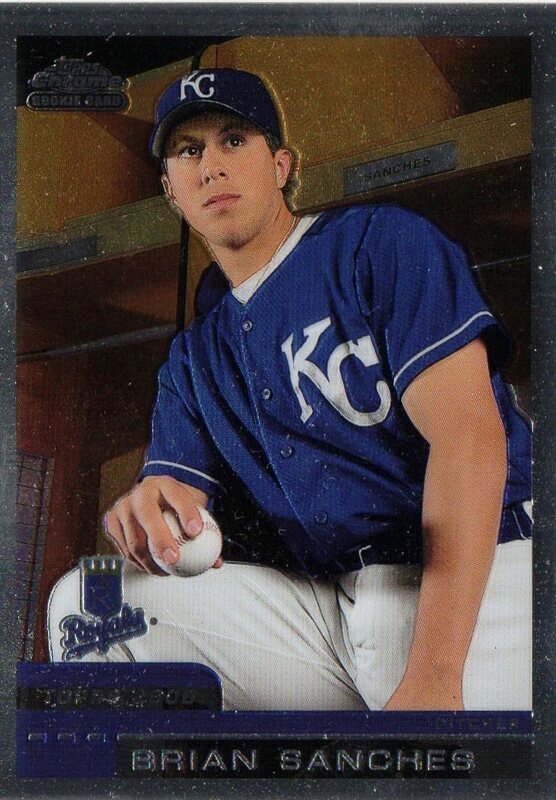 I picked this card because it was cheap and I saw he hit 25 home runs in the minors in 2011 - maybe if given the opportunity to get to the major leagues, Canha can be the next 'one month wonder' like Chris Shelton or Jake Fox at worst or possibly be another Josh Willingham at best. 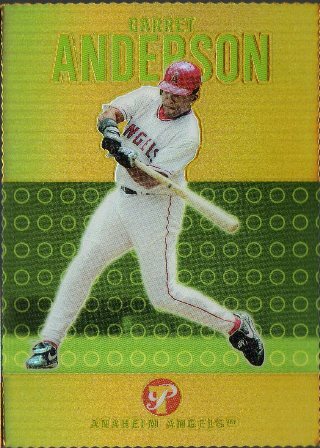 2003 Topps Pristine Garret Anderson Gold refractor [$4] - a shiny, numbered card of a former Angels star whose name is listed prominently among the top of the team's all-time offensive categories. 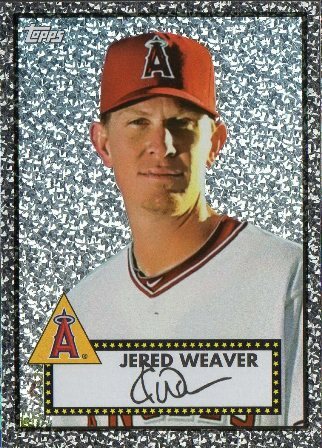 2011 Topps 60th Anniversary Black Diamond wrapper redemption Torii Hunter and Jered Weaver [about $0.69 each] - I was vaguely aware of the early 2011 Topps Series I promotion, though never bothered to look into it because it was hobby exclusive. 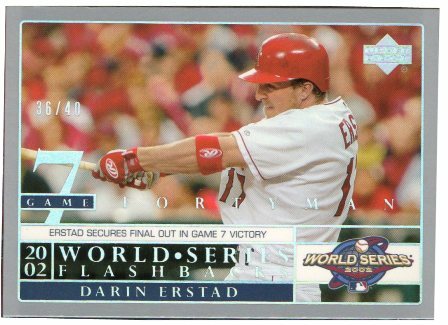 2003 40-Man Darin Erstad Rainbow parallel #'d to 40 [$2] - I figured I'd better just grab the card sooner [rather than never] and not worry whether or not it was worth picking up. 1996 Studio Tim Salmon Hit Parade insert #'d to 5,000 [$1.15] - can I really do any extensive digging through a card shop or a card show [these days] to find a forgotten insert like this? 2006 Upper Deck F/X Tim Salmon Red #'d to 40 [$1] - this parallel is from was printed the same year Salmon finished up his playing career. The card itself has a nice, shiny finish and it's numbered too. 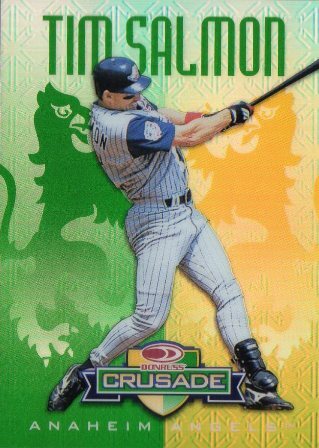 2002 Upper Deck 40-Man Tim Salmon Rainbow parallel #'d to 40 [$5] - I've never been aware of these parallels from Upper Deck's answer to the 'comprehensive' Topps Total sets from the early 2000s. 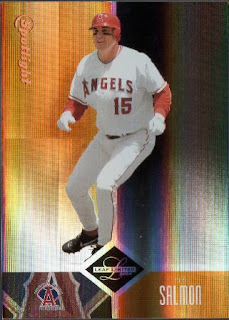 2004 Leaf Limited Tim Salmon Spotlight parallel #'d [$1] - it is shiny and numbered. 1996 Bowman's Best Preview Tim Salmon Atomic refractor [$1] - not a bad looking parallel of an insert card. 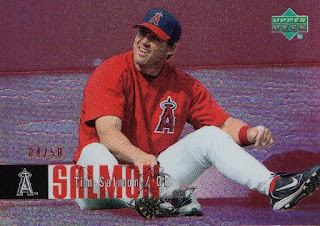 My third ever purchase on COMC was a Salmon 1998 Donruss Crusade insert #'d to 250 for $14.50 - I probably overpaid for this card, but the retired Salmon is my favorite Angel and at times I'm tempted to go pick up random cards of his for my personal collection. 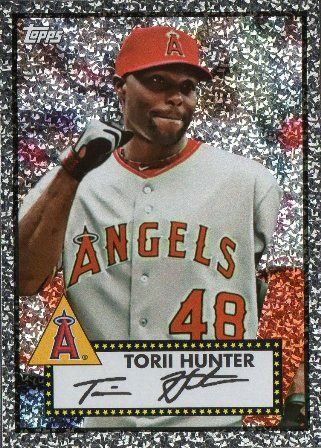 While I dutifully collected trading cards through the 1990's, I honestly seem to be in the dark about shiny, seemingly harder to find / find insert cards - it maybe refreshing to discover cards that I've never actually or have only been vaguely aware of during the last 15 years. My first Check Out My Cards shipment arrived in a little more than a week - eyeballing the 14 cards I had shipped through their bulk shipping option, there were no obvious problems with any imperfections that may have been caused by shipping. 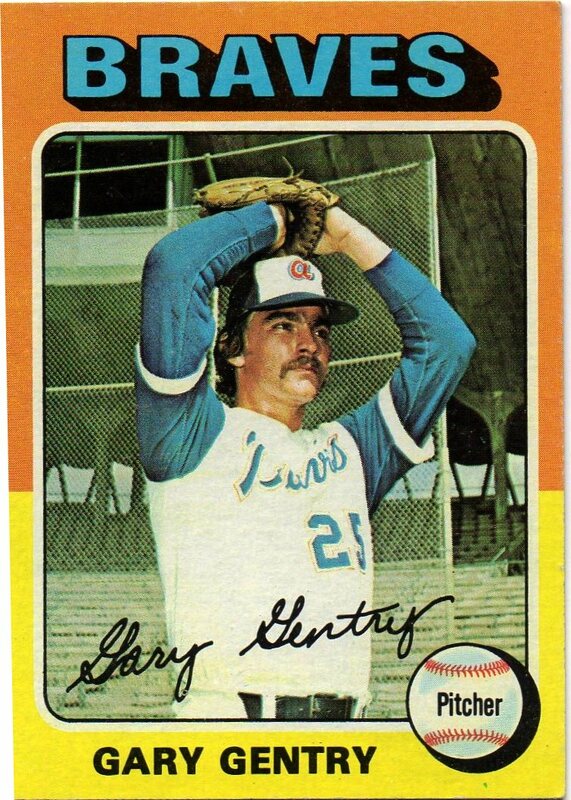 The cards I had shipped were placed [no penny sleeves] into a team set bag sandwiched by two top loaders and placed into a bigger team set bag - my package was shipped in a bubble mailer and came with a print out of the invoice sent to me through e-mail. 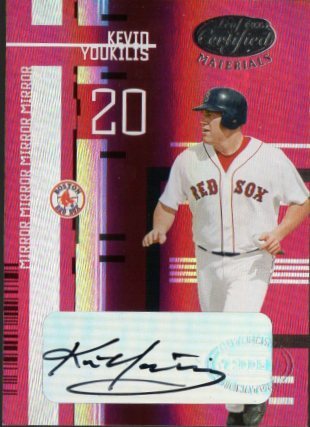 I'm giving myself a 'four post window' to sort of talk about the cards I got from COMC - my first ever COMC purchases were a couple of Kevin Youkilis certified autograph cards for $10 each. 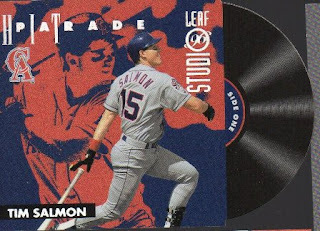 The only time I got Youkilis' autograph in-person was on my 'autograph book' all the way back when he was a rookie in 2004 - so I wanted to have a couple of certified autograph cards of his for my A-Z singles collection. 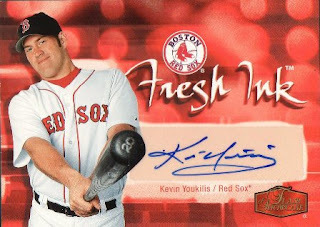 'Youk' is not a Hall of Fame bound player but has put in his time in the Major Leagues as a 'regional star' and his certified autographs will always have some value - even if it's only the $20 I paid for the two cards I picked up. 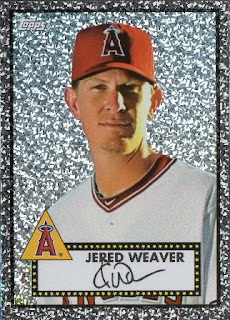 I want to make a joke that I've lost track of where former Angel phenom Casey Kotchman is going to be playing in 2012 - it looks like he'll be playing for the Cleveland Indians after a 'bounce back' season last year. 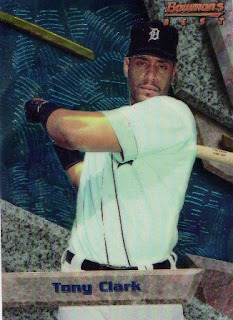 I like the 2012 Topps card because it features Derek Jeter as a 'Bonus Baby' - a search on Getty Images confirms Jeter's cameo appearance on Kotchman's card. I picked up a 72-card box of 2012 Topps and this was what I redeemed with my one per box Golden Giveaway code card - hopefully I'll be able to redeem a future code card for an actual card I can have delivered. Sean Casey c/o MLB Network - signed my cards in blue Sharpie in about a month or so. I have set cards put aside for the Casey, but ended up sending random cards, I could afford to lose in the mail - I think I have a Mitch Williams request I sent c/o MLB Network that I haven't gotten back, so I wasn't sure if the address worked. 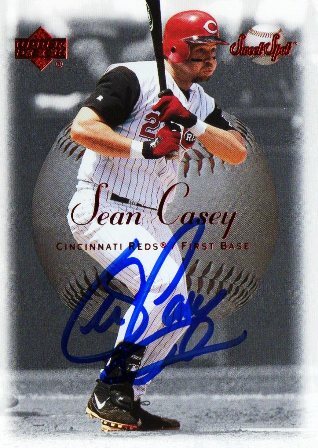 Casey didn't for a lot of power as a Major League first baseman - but he was a pretty good hitter and seems like a very personable guy otherwise. I don't have recollections of Gary Carter as an active player except from highlights of the 1986 World Series replayed from time to time and maybe through random baseball cards I've had through the last 20 years - I was fortunate to get his autograph in-person several times through golf tournaments, when he managed an independent league team in his hometown of Fullerton, California and the last time at the 2010 All-Star Fan Fest. 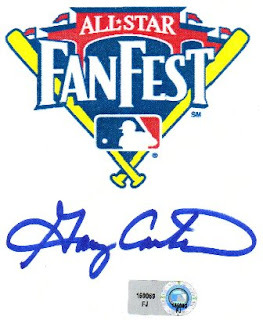 Pictured is an 8x10 sheet of paper with the 2010 All-Star Game logo - he wouldn't sign anything else at the 2010 All-Star Fan Fest and this was sore topic for one obnoxious dude with a video camera and a YouTube account. 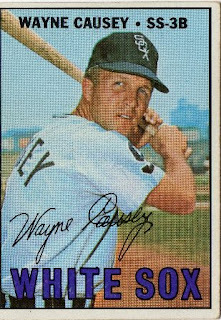 A story I'll probably always remember is trying to get autographs at a particular golf tournament down in Rancho Santa Fe California one year - it was raining and wasn't ideal weather for scoring autographs. 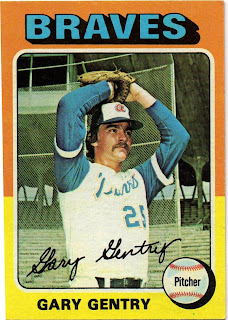 However, since my friend was driving and we were not local to the area, we kind of hung out for a while - we were barely able to stop Carter and his driver in a golf cart; he signed a baseball for me, but smirked and tossed the ball nonchalantly up in the air. I had to grab the ball real fast and do a little balancing act with my feet - so the ball wouldn't fall into the wet ground. Very intermittent and inconsistent WiFi and access to Internet cafes during a three week vacation to the Philippines had sort of allowed me be updated on baseball card stuff like 2012 Topps having come out - though without the ability to go to a store to see what the cards look like themselves. 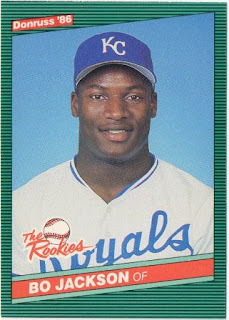 During some down time abroad, I started to list my personal collection cards - I worked on initial lists of Top 30 PC cards, Top 30 Alternate PC cards and a Top 50 'Fun' PC, to sort of see how many I can name without having the cards in-hand. After signing up and adding $65 to my account, I was also 'playing' with Check Out My Cards - I purchased about 15 cards through the last three weeks and through the folly of their s/h handling charges, had all but one shipped to me under their bulk shipping option. 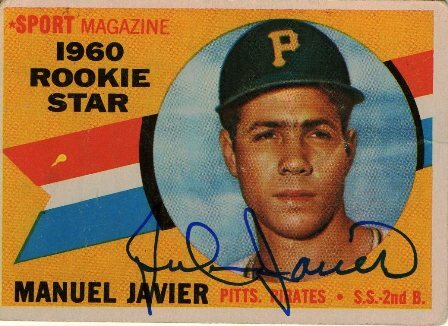 While I was hoping, I wasn't really counting on getting the cards when I got back to California Wednesday afternoon - the only thing of note I found in the stacks of mail at home was a success from former Major Leaguer Julian Javier. I mailed this request with two $0.64 stamps, hoping it reached Javier - the man is 75 years old and living in the Dominican Republic, where mail delivery has a supposedly sketchy reputation. I sent $3 with my request about a month ago, hoping it would be enough - my card was actually returned signed in blue ink and I was pretty happy with how it came out. 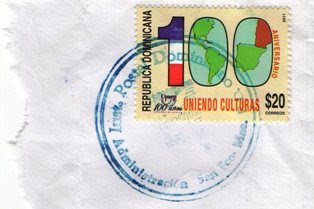 I think I sent the equivalent of 116 Dominican pesos - so I assume it was much more than enough to buy postage [which according to Google was only about $0.52] to send my card back.